Moist. Bottomland forests, moist woods, meadows, thickets, swamps, streambanks. Dappled sunlight to light shade. This is a relatively large, delicate, perennial fern that rises from a short-creeping rhizome and fibrous roots. The rhizome is sometimes semi-erect and often branched. It usually has the bases of dead stalks still attached. It often forms small colonies. Sterile and fertile fronds are similar in appearance. 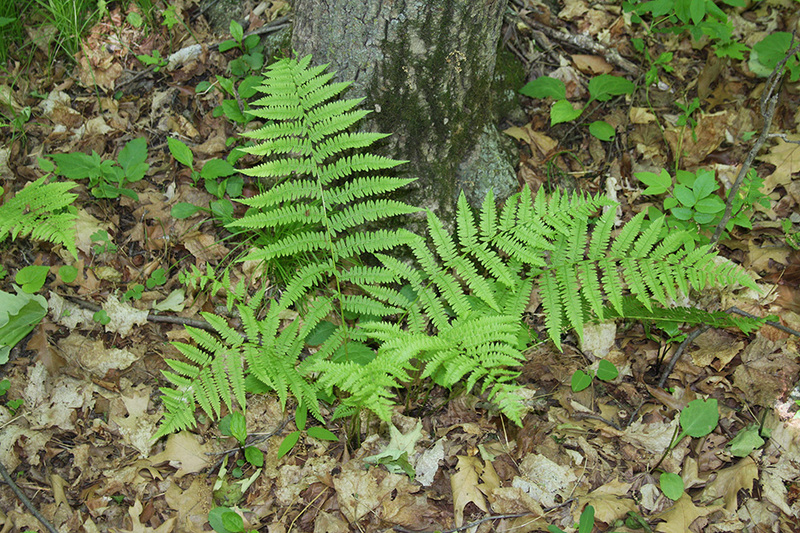 The fronds are deciduous, erect, arching, 11½″ to 36″ long, and lacy in appearance. They form a compact, somewhat circular but irregular cluster. The leaf stem (stipe) is 6″ to 21½″ long, shorter than the leafy portion (blade). It is stout and light green or straw-colored for most of its length. It is flattened at the base and becomes deeply grooved toward the top. At the base it is dark reddish-brown or black, swollen, and has 2 rows of teeth. The stipe is covered with scattered chaffy scales. The scales are brown to dark brown, linear to egg lance-shaped, 5 ⁄16″ to ⅜″ long, and 1 ⁄16″ wide. The blade is elliptic, 12″ to 30″ long, 4″ to 14″ wide, 1 to 1½ times as long as the stipe. It is pinnately divided into 30 to 40 pairs of leaflets (pinnae). It tapers to a point with concave sides along the tip, and is widest below the middle. The 4th or 5th pair of pinnae is the largest pair. Only the lowest two pair are shortened. The lowest pair is conspicuously angled downward. The central axis of the blade (rachis) is pale green and usually hairless, sometimes sparsely glandular or hairy, sometimes with a few scattered scales. The pinnae are oblong lance-shaped, short stalked or stalkless, and taper to a narrow point with concave sides along the tip. The longest pinnae are up to 8″ long or longer, becoming shorter as they approach the tip. They are deeply, pinnately divided, with 12 to 20 segments (pinnules) per side. The pinnules are variable. They are linear to oblong, angled at the tip, and asymmetrically wedge-shaped at the base. They are stalkless and may extend along the central axis of the pinna (costa) at the base. They are often deeply lobed (pinnatifid), cut up to halfway or more to the midrib (costule). The upper and lower surfaces are medium green to yellow-green and hairless. The veins visible on the underside are forked. They are free, meaning they do not rejoin but extend all the way to the margin. The margins are minutely toothed, tough, and firm, but elastic. The rachis, costa, and costule have a V-shaped groove on the top. The groove of the costule connects with the groove of the costa, which connects to the groove of the rachis, which connects to the groove of the stipe. The reproductive structures are born on the underside of the pinnules near the base. There are several clusters (sora) of spore-bearing cases (sporangia) arranged in one row on each side of the midrib halfway between the midrib and the margin. The sorus is narrowly oblong to linear, usually straight, and sometimes hooked at the end or horseshoe-shaped with the hook curled over a vein. It is covered with a protective veil (indusium). The indusium is the same shape as the sorus. It is irregularly toothed and has a fringe of hairs along the margin. It is attached to one side of the sorus. There are 64 yellow or brown spores per sporangium. 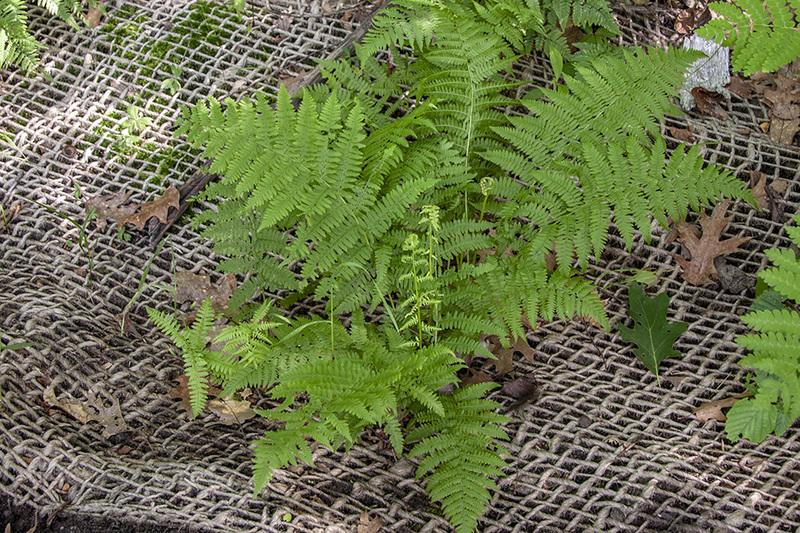 Northern lady fern (Athyrium filix-femina ssp. angustum f. rubellum) has a reddish stipe and rachis. The fiddleheads are reddish. 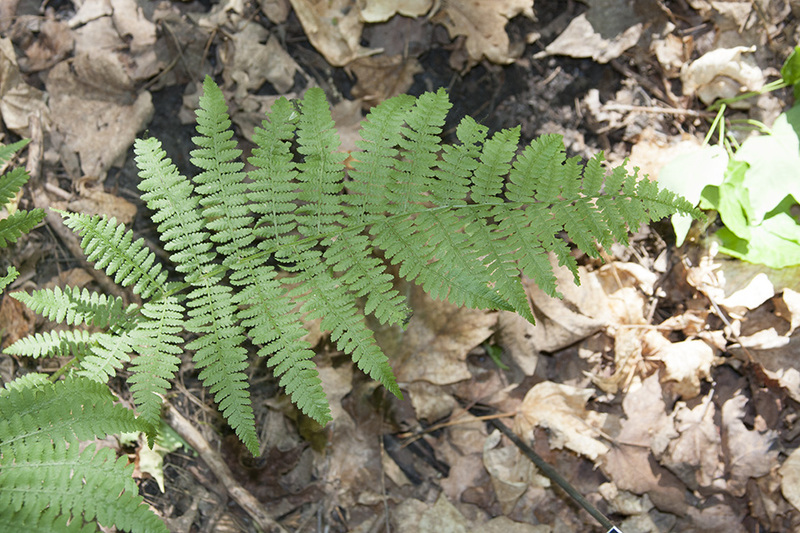 Common wood fern (Dryopteris intermedia) fronds are evergreen, not deciduous. The sori are round. The indusia are kidney-shaped and are attached at the base of the notch. Northwestern lady fern (Athyrium filix-femina ssp. cyclosorum) scales on the stipe are much larger, up to ¾″ long and 3 ⁄16″ wide. The blade is about 2 times as long as the stipe. It is broadest at or just above the middle. The sorus is always hooked or horseshoe-shaped. The indusium has a fringe of longer hairs along the margin, the hairs as longer or longer than the width of the indusium. The spores are always yellow. 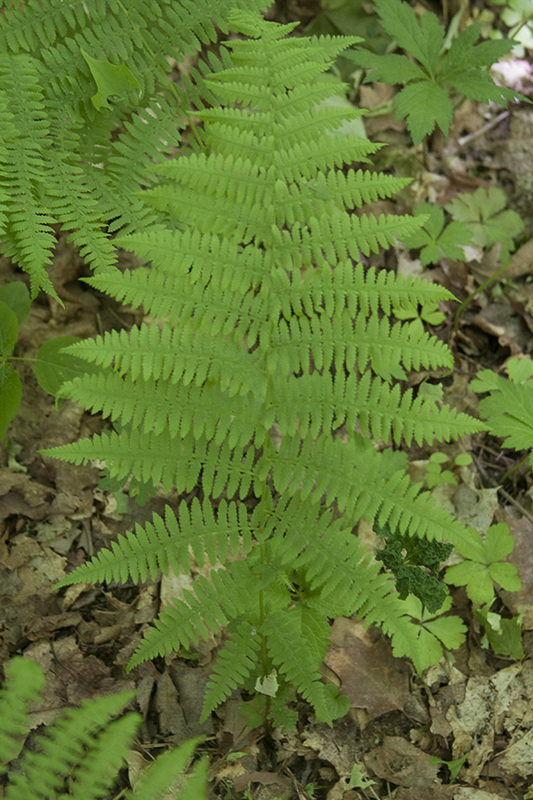 Spinulose wood fern (Dryopteris carthusiana) fronds are evergreen, not deciduous, and are usually smaller, no more than 30″ long. The sori are round. The indusia are kidney-shaped and are attached at the base of the notch. Distribution Sources: 2, 4, 5, 7, 28. The central axis of a pinna, to which pinnules are attached. The midrib of a pinnule. In ferns, a veil covering the cluster (sorus) of spore-producing structures (sporangia). The ultimate segment (individual leaflets) of a twice or more compound leaf or fern frond. 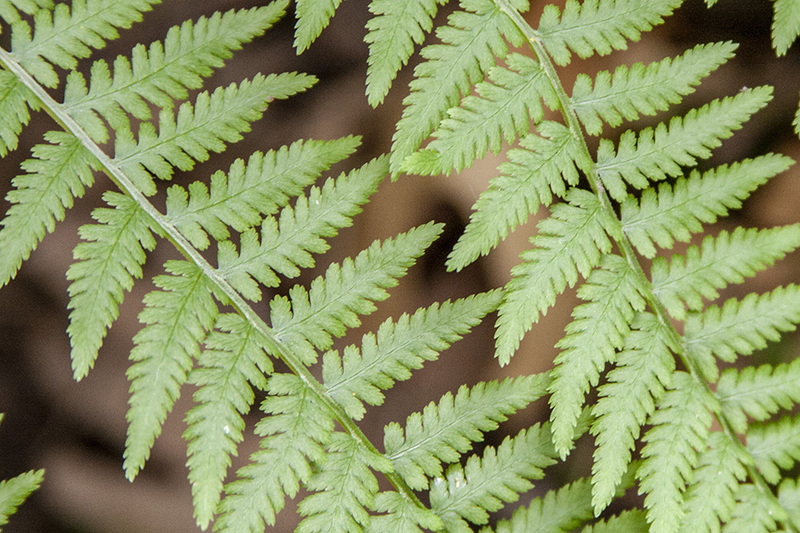 You may have Lady fern in your own house. Many people use it to decorate their homes. You may see it hanging or potted. People in Victorian times were crazy about Lady fern. However, Lady fern is not only found in the house. It also grows in the wild, especially in deciduous forests and the taiga of North America and Eurasia. Lady Fern is a deciduous, perennial fern about 24 to 36 inches tall. Its light green, lacy leaves are about 24 to 30" long and 6 to 9" wide and tapered at both ends. The fronds are cut twice and grow from a central base. The J-shaped spore casings, or sori, grow on the underside of the leaf.